I have received a lot of criticism* for some recent blog posts and images that I posted on Twitter and LinkedIn. Often, this means that one has revealed some uncomfortable truths. Perhaps clarification is needed, particularly with regard to the images shown below. It seems many people missed the message that I was trying to convey. I hope that you find what follows to be thoughtful and constructive, and also see it as nothing more than an honest discussion of important problems that we face. The headers in these two images is “Lean Leadership.” That is the overall context. The captions that accompanied these images read: “‘Respect for People’ enables CI. The more you know about RP, the better the CI.” (left image) and “As much to learn about ‘Respect for People’ as there is ‘Continuous Improvement. '” (right image). These words represent informed views based on my Lean practice, knowledge of Lean history, and scholarly contributions to Lean leadership. The information the above images convey relate to the timing and the quantity of work from the influential Lean Enterprise Institute (cited as lean.org, i.e. the publisher) related to the “Respect for People” principle in Lean management. 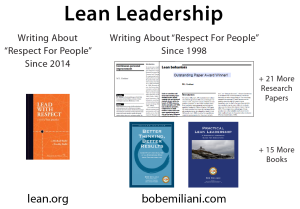 LEI considered “Respect for People” important enough to publish a book about it in 2014, seven years after James P. Womack wrote about “Respect for People” in an e-letter to the Lean community (note that the e-letter is narrowly focused on the employee-manager dyad, not on the network of stakeholders – employees suppliers, customer, investors, and communities – as Toyota has long practiced it), and, remarkably, 13 years after Toyota published “The Toyota Way 2001” which made the existence of the “Respect for People” principle explicit and therefore obvious to everyone in name if not in substance. If “Lean” is indeed another way of saying “Toyota Production System (TPS) and the Toyota Way,” then shouldn’t the “Respect for People” principle have become prominent in a big way much earlier than 2014 or even 2007? This likely would have helped diminish the power that the long-running six criticisms of Lean have on reducing employee interest and buy-in for Lean management. It would have benefit other stakeholders as well. 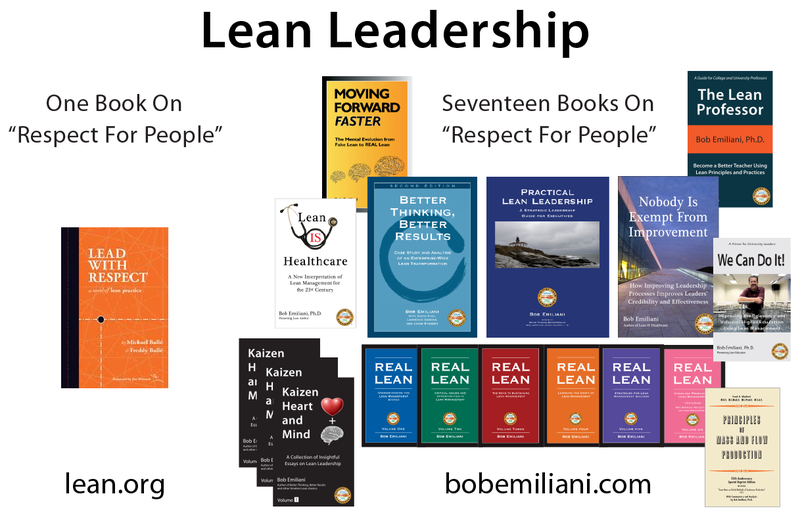 Since its inception in 1997, the Lean Enterprise Institute has published many books on Lean tools (along with associated training courses), clearly viewing this as more important than the principle that is critical to the proper functioning of progressive Lean management in the real world: “Respect for People.” This, in my opinion, was a strategic error (a process problem) in the effort to advance Lean management in organizations world-wide – despite a shift in focus beginning in late 2007 to Lean management and new training courses on Lean leadership. Why was this a strategic error? It is because history tells us that managers naturally gravitate to new tools (Lean or other) with little prompting. They are always looking for a tool to make a product or process better. But, the enabler for continuous improvement is “Respect for People” – not the other way around. Therefore, the “Respect for People” principle (termed “respect for humans” in the late 1970s by Toyota) should have been the major point of emphasis from the start, not Lean tools. That is one of the lessons learned from the Scientific Management era (1890-1940). Not recognizing this helped perpetuate the existence of tool-based Lean – Fake Lean – for nearly two decades. And along the way, many people lost their job as a result of Lean (sometimes in combination with other contemporaneous factors such as globalization, the Great Recession, rising executive compensation, etc.). Fake Lean did harm; that is serious stuff! The “Respect for People” principle exists in part to ensure that progressive Lean management does no harm. That is important! The “Respect for People” principle is important to all stakeholders as well as the Lean movement if it is to survive long-term. Interest in survival of the Lean movement is shared by us all, but what about the effect of Fake Lean on stakeholders? The evidence indicates not so much. This has long been a big interest of mine, in part because I personally witnessed many layoffs directly as a result of Lean, suppliers squeezed on prices, customers receiving defective products, communities harmed by loss of tax revenue, and so on. The “Respect for People” principle is so important that its existence can be found throughout the history of progressive management, beginning with the work of Fredrick Winslow Taylor in the late 1800s through the first few decades of the 1900s (“Cooperation”), followed by the work of Frank George Woollard in the 192os and 1930s at Morris Motors in the U.K. (“Benefit for All”), and to Toyota in the 1950s onward. Why? Because you do not get continuous improvement or flow if people are harmed, especially employees. No stakeholder wants to experience zero-sum (win-lose) outcomes because nobody wants to be the loser. All stakeholders want non-zero-sum (win-win) outcomes – which was one of Fredrick Winslow Taylor’s goals. 3. Respect-for-humanity, which must be cultivated while the system utilizes the human resources to obtain its cost objectives. Remember, these important words appeared on page 2, not on page 149 or buried in a footnote or Appendix. Lean was not presented in this manner nearly 30 years ago, though it should have been because it would have saved many people a lot of problems. From a scholarship perspective, there was a failure to comprehend and acknowledge key findings and build upon the work of others (1, 2, 3) which diminishes the value of those works. This extends back in time to MITs International Motor Vehicle Program, the birthplace of “Lean Production,” where researchers, focused on the technocratic aspects of production, missed the very thing that makes TPS (Lean) work. Clear evidence of the need for “Respect for People” can be found in the influential Training Within Industry program used by Toyota post-World War II (i.e. Job Relations Method), and in relations with automobile dealers and suppliers. Monden’s book, directly connected to Taiichi Ohno himself, deserved much greater presence than two footnotes in The Machine That Changed the World and one bibliographic citation in Lean Thinking. From my extensive study of the evolution of the “Respect for People” principle in progressive management, this was just too big a thing to miss. But, more importantly, from my experience in shop floor kaizen (with Shingijutsu starting in 1994), “Respect for People” was too big a thing to ignore. I could clearly see in real time how this made Toyota’s production system (Lean) work. The information this image conveys is as follows: Is it not remarkable that the “Respect for People” principle, so fundamental and hugely important to the proper functioning of progressive management, is conveyed as a novel? Wouldn’t non-fiction accounts of how real managers comprehend and put into practice the “Respect for People” principle be more instructive? In my view, the learning that students of Lean can derive from the real world, the genba, is far more impactful that what they can learn from an imaginary world, the kyokō. It is similar to the difference between a Hollywood movie and a documentary. The former often contains inaccuracies and uses various devices to facilitate story-telling, while the latter is a better representation of what truly happened and therefore a better guide for taking action. Don’t get me wrong, I realize that people can learn from fiction as well as non-fiction. New contributions that help people understand the “Respect for People” principle is a good thing. Buy Lead With Respect; you might learn many good things. The problem is not the book or its authors. The problem is choosing to fictionalize something so important as the “Respect for People” principle – in addition to the problems highlighted in the previous images reflecting the timing of the work (incredibly late) and the quantity of work that is focused on “Respect for People” (basically, just one). It would have been better if “Respect for People” appeared Just-In-Time, say by the late 1980s – or soon thereafter as new evidence emerged from the NUMMI experience, or when Toyota/NUMMI alumni John Shook joined LEI in the late 1990s. But it did not. The question now is: Is it Just-Too-Late? Has the “Respect for People” principle been solidly endorsed by the influential Lean Enterprise Institute (and the influential Lean Enterprise Academy) too late in the Lean management life cycle? No one knows for sure. But, being so late has surely hurt both people and the Lean movement. 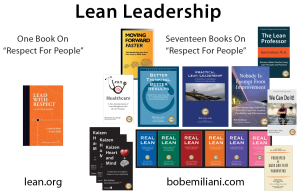 While influential people can argue that much has been accomplished, someone like me observing Lean unfold over the last 20 years (and practicing Lean), with perspective going back over 100 years, can say that little has actually been accomplished because the “Respect for People” principle was ignored or discounted for so many years. The flourishing of harmful Fake Lean could not have been the intended outcome to-date. Or maybe it was. Either way, we got a lot of Fake Lean that must now be converted to Real Lean. 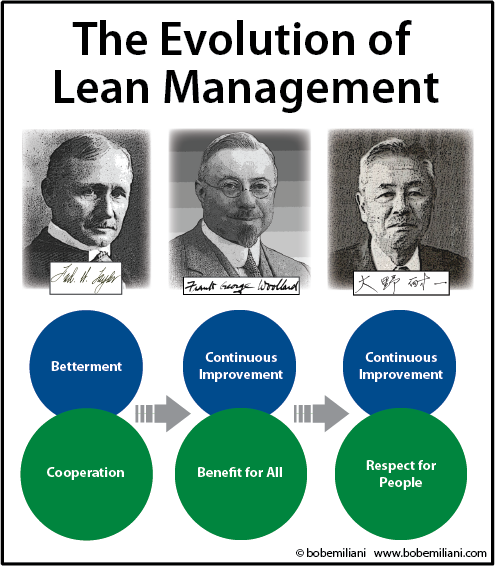 That is difficult work because we know well that Fake Lean sells far better to managers than Real Lean, whether now or 100 years ago. The Scientific Management movement suffered the same problem – managers and consultants cherry-picked tools in preference to adopting the system in its entirety. Throughout history, the cherry-pickers enjoyed great success while those who promoted and taught the entire system did poorly. Their countermeasures did not work well then, and they are largely the same countermeasures in use today. The harm done to workers through layoffs and other unfavorable practices associated with Fake Lean may not have been anticipated, but even a casual reading of the history of progressive management shows there was near 100 percent chance of that happening in nearly every organization (click here to read Henry Gantt’s views from 1916 on how managers should treat people). Therefore, it should have been anticipated and practical countermeasures devised. Again, failure of the big influencers to forcefully bring the “Respect for People” principle to the forefront sooner, say in 1985, 1988, or 1997 was, in my view, a huge strategic error. Could the Lean Enterprise Institute (and also the Lean Enterprise Academy) have done better? Yes, I think so. And so could we all. The Lean Enterprise Institute is but one of many Lean-focused non-profit organizations. And there are many for-profit organizations that either followed their lead or independently took a similar path. The result, however, is that much time has been lost, and we must all now focus on re-work whether we like it or not. This turnback will take more time and a lot of effort to correct – time that we may not have, assuming Lean management experiences a similar life cycle as Scientific Management did. The life cycle of Lean could be greater than 50 years, which would be good. 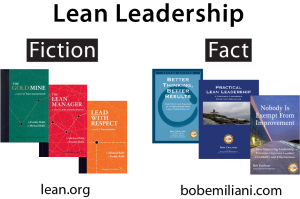 But, has the Lean tools view of Lean management become too broadly and deeply rooted to make corrections in anything more than a small number of organizations? Of course, we have to try, but a tough job is now made tougher – even if we were to all happily work closely together. And we must do this as software and computers rapidly take on more tasks that humans do, affecting people’s jobs and the workplace. Perhaps now you better understand my recent blog posts and images the essence of which was to challenge people’s thinking and pose questions relevant to us all. It was not to disparage the book Lead With Respect (which is as necessary now as it was in 1925, the dawn of the study of leadership) or its authors, Michael Ballé and Freddy Ballé. I have no disagreement with them. They are knowledgeable guys. I did not mean to imply that the Lean Enterprise Institute discovered “Respect for People” in 2014 (2007 seems to be the date). Nor was I seeking to stoke a philosophical debate; there are clear factual differences. I did not mean to imply that I know more than others or that I occupy a position superior to others (nor do I think that). And, no, have I not gone mad – but thank you for your concern. I am just a simple teacher working full-time on the front lines of public higher education, teaching four different courses per semester, trying to make things better for students by applying Lean principles and practices to teaching, doing some research and writing in search of the truth, and trying to help people who want to learn more about Lean leadership. That’s what teachers do. It is up to readers to evaluate the available books related to the “Respect for People” principle and make their own decisions concerning their quality, practicality, and utility. My hope is that you will recognize the importance of improving leadership behaviors through my work as well as the work of others. But, I hope you also recognize that improved leadership behaviors, while necessary, is not sufficient. There is more to learn that can be of even greater help to you. Specifically, how leadership beliefs inform leadership behaviors, which in turn informs leadership competencies, and how understanding leadership processes and how to reduce leadership process errors will significantly advance your practice of Lean leadership. 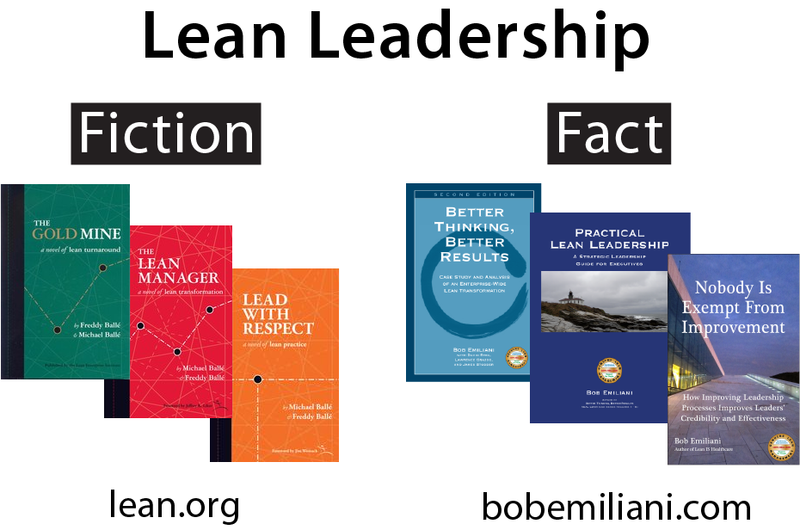 Finally, I hope that people who write about Lean management and Lean leadership will recognize the work of others and build upon previous works as I and some other scholars have done. The global Lean community who consumes information to help them advance Lean principles and practices in their organizations deserves no less. Happy reading, happy learning, and happy practice! * I wish to sincerely thank the people that offered both positive and negative feedback on the above images and on some of my recent blog posts. I truly appreciate your time and interest. I found all comments helpful, whether cool-headed, impassioned, or rude. I learned from them all. Feedback always results in positive improvement when it comes to the work that I do. Bob, I have been following you for a long time and have the greatest regard and respect for your refreshing, honest, no-holds-barred approach to lean. Like you, I have always believed that there can be no lean without respect for people. People covers humans working with all stakeholders. The more they criticise you the more you know you are right. I too am a simple teacher who has stopped consulting for Lean because in India I am unable to find company heads (leaders) who genuinely respect people.